The Charlie's Angels reboot is off and running. 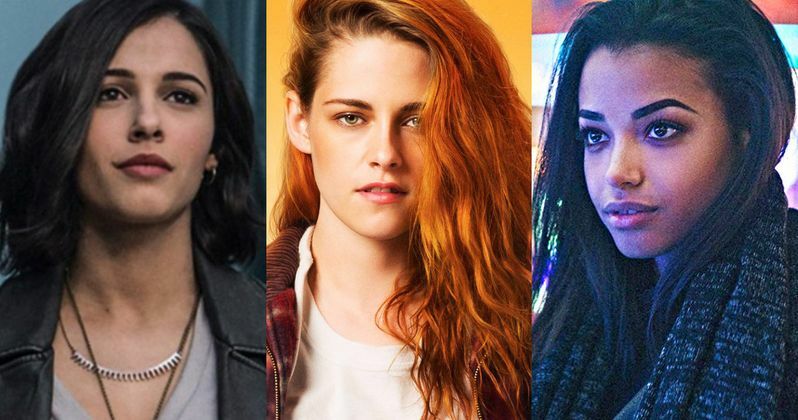 We've been hearing casting rumors for some time now, but Sony has made it official as Kristen Stewart, of Twilight fame, and Naomi Scott, who starred in last year's Power Rangers movie, are both set to star as two of the new Angels. Newcomer Ella Balinska joins them to round out the trio. In addition to confirming the cast, the studio has also set a new release date for the reboot, which is now set to arrive in theaters on September 27, 2019. This bumps it from the previous June 7, 2019 date. Elizabeth Banks will direct from a script she co-wrote with Jay Basu, who most recently penned The Girl in the Spider's Web, which Sony is also behind. Banks will be busy, as she's also set to play the new Bosley in front of the camera. Bosley is the handler for the trio of agents who connects them to their mysterious employer, who is never actually seen on screen and was voiced by John Forsythe in the original TV series. Billy Murray played the Bosley role in 2000's Charlie's Angels movie. Bernie Mac took on the role in 2003's Full Throttle. Banks had this to say in a statement about the reboot. "Charlie's Angels, for me, is one of the original brands to celebrate the empowered woman since its debut in the '70s. This film honors the legacy of Charles Townsend and his agency while introducing a new era of modern and global Angels. I couldn't be more excited to work with Kristen, Naomi and Ella to bring this chapter to fans around the world." The reboot takes the detective agency premise from the original 70s TV series and previous set of movies directed by McG and takes the concept global. the Townsend Agency is now a worldwide security and intelligence service that has teams located all around the globe. This new movie will focus on one such team. This is the first movie that Elizabeth Banks will be directing since she helmed Pitch Perfect 2 in 2015, which went on to find great success at the box office. In addition to her duties as writer, director and star, Banks is also producing the movie with her husband Max Handelman, via their company Brownstone Productions. Needless to say, that's going to keep her quite busy over the course of the next year or so. This marks a return to big-budget flicks for Kristen Stewart, who has taken to starring in smaller movies such as Personal Shopper and Cafe Society in the past few years. Naomi Scott is very much on the rise, as she's also playing Jasmine in Disney's live-action Aladdin next year. For British actress Ella Balinska, this represents a huge break. There's no word yet on when cameras are set to begin rolling on the new Charlie's Angels movie, but we'll be sure to keep you up to date. This news comes to us courtesy of The Hollywood Reporter.